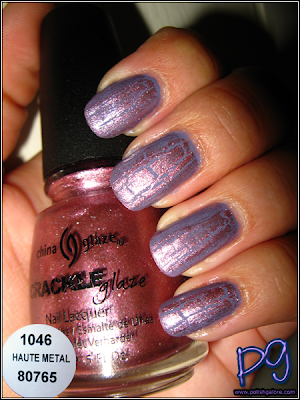 Somehow, this little one slipped away from me while I was reviewing the "Metals" crackle collection from China Glaze. Haute Metal is a rosey reddish pink crackle that doesn't look good over pink (heh, tried and failed) but I figured I'd try it over my Dr.'s REMEDY Lovely from yesterday. This is one coat of Haute Metal, topped with Seche Vite. I think the moral of the story is that this color is best over dark colors. It gets a bit lost with the purple underneath. A bit more noticeable in the shade but it reminds me of like an 80s rock candy or Easter egg or something... Hah I don't know - guess I'm reaching a little bit here. Finally indoors with the flash. What is your take on crackle/shatter/graffiti polish? Is it cool still? Are you totally over it? My business cards feature my neon skittle crackle nails and at Cosmoprof North America Las Vegas, a lot of beauty business owners that I gave my card to were mentioning that crackle/shatter is "so over" already. What's the next big trend? Will magnetic nail polish make it mainstream? I do have a lot of that to show you but it's going to be on super nubbins after breaking 3 nails yesterday. (Fun fun). Stay tuned! Oh wow that looks so nice an sweet over the lilac!